This is a post written by Echo Yu-Hsun Hsu, a Phd-student who spend her last summer on Lundy doing sparrow fieldwork. It gives a good impression what it is like to spend a couple of month on a remote island, with only birds, staff and tourists around. It was midnight, and the electricity of the whole island was turned off. Surrounded by the darkness and quietness, I was laying on the grassland at the camping site. I could only hear the wind blowing through the air and the grass, and the shearwaters calling when they flew close by. I opened my eyes and saw the starry sky just above me, sparkling planets in the infinite universe. When my mind was wandering through the endless darkness, a shooting star suddenly flew through the left hand side of the sky. Soon a smile was painted on my face. “What a nothing special but beautiful night it is. Now it is time for bed so that I can wake up with sparrows at dawn,” I talked to myself. Then I went back to my caravan. This scene happened at the middle of May on Lundy Island, a small island 20km away from the southwest coast from the mainland of England. From late April to the middle of August this year, I was there to monitor the house sparrow population, and to collect the data for my PhD project. This sparrow population has been monitored for more than ten years. Sparrows on this island are mainly distributed within and around the village, which is at the south part of the island. 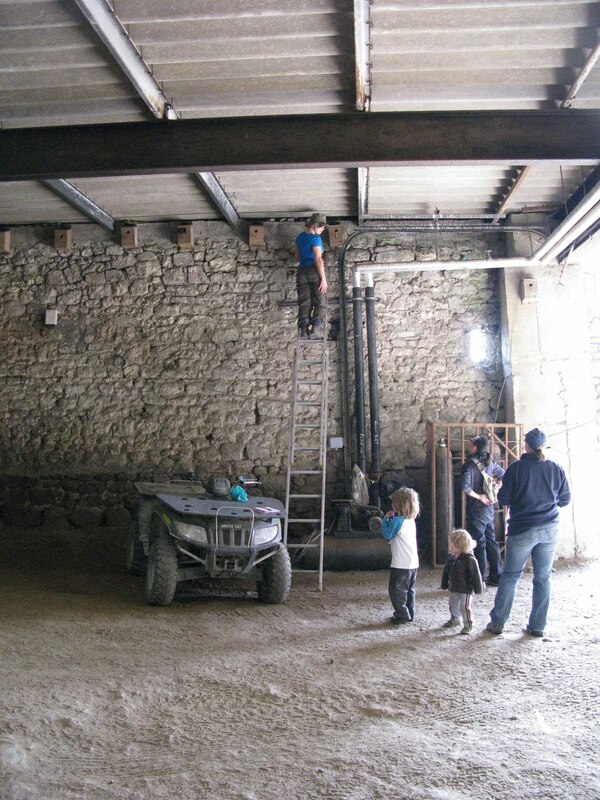 Throughout this area, our group put up more than 100 nest-boxes, mostly in farm buildings (e.g. barns), and some in the woodland, named Milcombe Valley. From the end of April till the end of August, Issie, another PhD student and I checked through all nest-boxes and other potential nest-sites for sparrows’ nests. Once we found a nest, we would monitor it from laying, hatching, provisioning till the chicks fledged. Most nests were higher than us, so we had to climb up the ladders to reach the nests. Many nests were almost twice as my height. Climbing up to those nests was a scary fun. However, the entire scare was put aside once we got some chicks. From red naked skin, eye-closed young nestling to the fully grown, ready to fledge old chicks, how fast the chicks grew in 12 days always amazed me! We also collected other information than chick growth, for example, information of the broods and the adults, and we tried to keep the data entry up-to-date. Working on sparrows filled most of our time on Lundy. Luckily Issie was a great workmate and a good friend. We shared work to fit each other’s needs, discussed what we observed, and exchanged ideas. We made a good team! Life other than sparrow work was also interesting. Issie and I worked part-time in the restaurant in exchange for our daily dinner. By working in the kitchen, we got to know the kitchen crew and then the other staff working for the Landmark Company. People there were very friendly to us. Sometimes they also shared their sparrow observations with us! Lundy Island is famous for its natural environment and because of this, many other researchers and visitors interested in animals come to Lundy. Issie and I had some good chats with mammal researchers, researchers who monitored the Manx shearwaters breeding on Lundy, and lots of amazing bird-watchers. We even had the chance to join the shearwater catching at night! There were also all sorts of amazing people. One day when I was trying to help an elderly lady climb up the hill, while she told me her real experiences during world war two. Wow! After more than one hundred sunsets from next to the old light house, the summer ended. All the sparrow chicks fledged and gathered together to forage. Migratory birds started to pass through Lundy. I returned back to New Zealand with lots of data to analyze. After finishing up the field work, Issie also left to Sheffield for her own study. Goodbye, Lundy. See you next year!